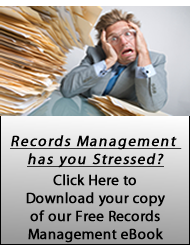 Corporate Records Management Services to help reduce costs and improve the efficiency of your business. Outsource your document storage, retrieval needs and realize significant savings. You CAN have access to a complete suite of corporate records management solutions to help secure your valuable corporate assets and information. With over 20-Years of Information Management experience, our team of experts can address a myriad of issues that your business may face, including developing a Records Management Plan, Designing appropriate File Structures and Taxonomies, and outlining a destruction plan. Shoreline Records Management offers a full-suite of comprehensive offsite Corporate Records Management Services and document storage solutions. We help companies to reduce costs and improve efficiency by serving as a trusted advisor and supporting your records management program. Whether your business has 50 employees or 50,000, our team of professionals understand the challenges of tracking and managing a corporate records retention schedule, and we provide the knowledge and experience to help your Corporate Records department run more efficiently. To contact Shoreline and begin to find out more about how we can assist your company to become more efficient and take control of your Corporate Records Management, please fill out this brief form or call us at 1-800-435-2956.